Sony has a couple of new digital cameras models that was announced to the market recently, namely the NEX-5 and NEX-3 that offers the quality of a digital SLR in a compact body which is a snap to tote around, be it in a small purse or jacket pocket for ultimate portability. These cameras aim to embody Sony’s make.believe spirit, and are touted to be game-changers for folks who have been waiting for a product like these, where other comparable alternatives in the market at the moment would be the Micro Four Thirds system from Panasonic, Olympus and Samsung. Dubbed mirrorless interchangeable lens camera (also EVIL camera, Micro, or Digital Interchangeable Lens system camera) by Sony, it aims to revolutionize the consumer experience by offering outstanding picture quality with a totally pocketable size. These models are proud to be the first interchangeable lens cameras with an APS-C sensor in the world that is able to continuously adjust focus and exposure while recording video. As for the NEX-5 camera, this puppy will offer Full HD movie capture (1080i AVCHD and 720p MP4) with Full HD 60i recording – now how about that? Apart from that, these cameras are size perfect when it comes to fulfilling the needs of point-and-shoot users who want to capture better images than their current level of skill ever can, while it also lets existing DSLR users bring around a no-compromise compact alternative – of course, purists would argue that nothing can beat DSLRs for their size, weight (for added stability) and performance, but we must admit that the gap is being bridged slowly but surely. Being totally different from conventional DSLR models, the mirrorless construction of the NEX-5 and NEX-3 will see a reduction in the thickness of both camera bodies to just about an inch at their slimmest point (after you exclude grip and mount portions of course). The NEX-5 is made out of magnesium alloy, while the NEX-3 comes with a polycarbonate casing alongside a newly developed 14.2 megapixel Exmor APS HD CMOS sensor. 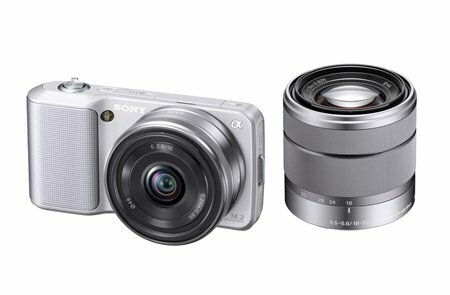 Both the NEX-5 and NEX-3 are also the first cameras to offer the extra convenience of high definition video recording, and will also boast Sweep Panorama. Basically, this means capturing large group shots is a a snap, involving press-and-sweep to capture breathtaking shots up to 226-degree horizontal or 151-degree vertical shots.The NEX-5 and NEX-3 cameras will retail for around $650 and $550, respectively when it hits the markets later this year. It’s okay if you like technology and stuff. HD quality products are over exaggerated and once you have it at hand and test it yourself, you realize the difference between HD and regular is absolutely minuet in resolution.